NetScanTools Pro is an integrated collection of internet information gathering and network troubleshooting utilities for Network Professionals. Research IPv4 addresses, IPv6 addresses, hostnames, domain names, email addresses and URLs automatically** or with manual tools. It is designed for the Windows operating system. **Automated tools are started interactively by the user. Affectionately called "NetScan" by our users, this software has a long user-driven development history and is used by thousands of network professionals and persons involved in 'ethical hacking'. Join the thousands of network professionals who rely on NetScanTools® Pro to solve their daily network problems. We give you a powerful set of network tools - put them to use wherever you need them the most. Looking for IPv6 network tools? We now have IPv6 enabled tools. Greatly enhances many familiar network tools. Saves time when gathering information about Internet or local LAN network devices, IP addresses, domains, device ports, and many other	network specifics. Simplifies and speeds up the information gathering process by Automating the use of many network tools for you. You enter an IP and press one button to use many tools. Produces clear, concise results reports in your web browser. At $249 for the installed version of NetScanTools Pro, it represents the best value of any investigative tool! Our new license cost (which includes one year maintenance) is less than the yearly maintenance cost for a competing network engineer's toolkit. Also available as a USB Flash Drive portable application -- and can be (or end user installed) on a fast USB Flash Drive with plenty of space for other great tools like Wireshark® Portable or NMAP. The NetScanTools philosophy is to bring together many network tools and utilities into one convenient interface. The tools are categorized below by function: active, passive, DNS and local computer. More tool details. There are many Active Discovery and Diagnostic Tools that you can use to locate and test devices connected to your network. Active discovery means we send packets to the devices in order to obtain responses. The Passive Discovery Tools are used to find information from third parties or to monitor the activities of devices connected to your network. Passive discovery means that we listen to packets other devices send in order to obtain information about the devices. The DNS Tools are very versatile and help you find problems with DNS. The DNS tools are divided between 'Core' and 'Advanced' toolsets. Version 11 introduced IPv6 specific DNS tools. These tools provide information about your local computer's network and also include general information tools that are not easily categorized. Click here for more details about the tools mentioned below. Powerful Core DNS Tools. Specify the DNS you want to work with. Use NSLOOKUP or DiG to retrieve any of 48 resource record types from a DNS. Use DiG +trace to check a domain name or IP address from the root servers all the way down to the authoritative DNS. Batch mode accepts a text list of IP addresses or hostnames and gives you the answers for all. Quickly find the most common DNS records for an IP address or hostname or domain name. Get Basic DNS Records gives you SOA, A, AAAA, NS, MX, CNAME, PTR, and TXT records from DNS using a single button push. Check a Domain's Zone in DNS. Two types of Zone Transfer give you the ability to review a zone. One automatically selects the Authoritative DNS for the zone and the other lets you enter the DNS manually. Powerful Specialized DNS Tools. We have specialized DNS tools for doing things you cannot do with NSLOOKUP. Auth Serial Check can be used to make sure a domain's authoritative name server zone serial numbers are in sync. DNS S/W Version may show the actual software version number a DNS is running (if they allow it). DNS Verify does an IP to Hostname to IP mapping check. IP Drilldown takes an IPv4 address and shows the arpa namespace records (SOA, NS, TXT, A etc.) for all 4 levels of an IPv4 address. ENUM accepts a VOIP telephone number and queries an ENUM e164 root server for the SIP or H323 records. SPF/Domain Keys shows those records for domain so you can check email authentication processes. Batch mode accepts a text list of IP addresses or hostnames and gives you the answers for all. Test your computer's default DNS settings. Your default DNS settings define which DNS's process IP address or hostname lookups during things like web browsing - The Test Default DNS tool talks directly to each default DNS your computer is using and tells you if it is working and how fast it is. We have a Simple Query tool for testing your computer's ability to lookup an IPv4 or IPv6 address or hostname. Find out who owns a domain name or an IP address fast with our advanced whois and rwhois query tools that feature automatic whois server selection. Need to lookup several domains quickly? Batch mode is there for you. Where is an IP address located? Our IP to Country tool can show you the country it is supposed to be located in. This feature is also integrated into whois and traceroute. Find active devices in any IPv4 address range using our ping scanner utility (also called NetScanner). Find hidden IPv4 devices on your local network segment or subnet (LAN). ARP Scan exposes hidden devices that do not respond to ping. Find the SMB versions supported by other computers. The SMB Scanner takes a list of IPs or hostnames and shows the SMB versions supported by the target. Find visible, hidden and writable shares in a Microsoft Windows Domain. Network Shares uses SMB/CIFS/NetBIOS to show visible and hidden shares. It can do a writable share test find shared directories exposed to attacks by worms and viruses. Find open TCP or UDP ports on a device. The Port Scanner tool uses several different methods to determine if a TCP or UDP port is open or active on a target machine. Display your DHCP Server offerings, check for misconfigured offering and find rogue DHCP Servers using the DHCP Server Discovery tool. Find the route packets are taking from your machine to a target machine. Traceroute includes the firewall penetrating TCP traceroute plus standard ICMP and UDP traceroute methods. Traceroute now supports IPv6 targets. Validate an Email Address. Email Address Validation can tell you if an email address will work. Test SMTP email servers. Send test mail and check for an Open Relay. Capture packets from your network. Packet Capture lets you see networks packets going through your wired ethernet interface or wireless 802.11a/b/g/n interface. Preserves packet data for future analysis and export packet captures to other analysis tools like WireShark. Gather data from network devices using our Simple Network Management Protocol (SNMP) tools. SNMPv1/v2c/v3 tools include walk, get, set and several advanced queries such as remote ARP cache, remote listening ports and more. The SNMP Dictionary Attack tool can try to guess the community name of an SNMP enabled device. Find and keep track of IP/MAC Address Mappings. IP and MAC address associations found using	NetScanner, ARP, SNMP, and SMB can be automatically updated and maintained in the IP/MAC address management database. Numerous useful utilities like Subnet Calculator, TTCP for network speed checking, Ping, ARP Ping, and	safe URL web page capture with obscured URL decoding. Map Network Switches (optional). The optional Manage Switch Port Mapping tool works with many brands of SNMP enabled managed ethernet network switches to discover and show devices connected to the physical switch ports. Find hidden IPv4 devices on your local network segment (LAN). 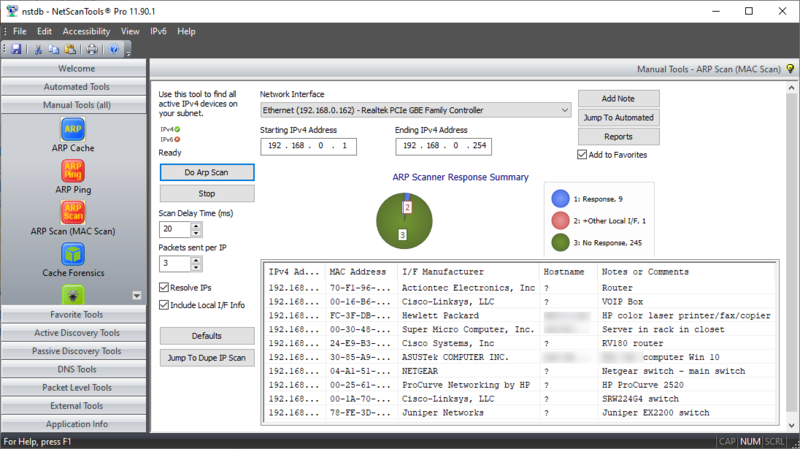 ARP Scan shows all active IPv4 connected devices even if those devices have an integrated firewall protecting them from standard ping sweep or port scan methods. Find IPv4 devices on any reachable network. NetScanner is a ping scanner that can find IPv4 connected devices on any reachable IPv4 network. Find devices listening to network traffic on your local network segment (LAN). Promiscuous Mode Scanner shows devices listening to (snooping/sniffing) network packet traffic. Check a device for listening TCP or UDP ports. Port Scan checks for unauthorized or unintentionally installed services or open listening ports on IPv4 connected devices. Test the response of a device or firewall to TCP/UDP/ICMP or CDP packets. Packet Generator (TCP/UDP/ICMP/CDP/ARP/RAW)	along with Packet Capture can assist in testing systems and firewalls for response to unusual customized packets. It can even send a 'RAW' packet completely of your own design. Find the SMB versions supported by other computers. The SMB Scanner takes a list of IPs or hostnames and shows the SMB versions supported by the target including the insecure, vulnerable SMB 1.0. Find visible, hidden and writable shares in a Microsoft Windows Domain. SMB/CIFS share detection shows visible and hidden shares. It can do a writable share test find shared directories exposed to attacks by worms and viruses. Find IPv4/IPv6 address owner or allocated business and what country they are from. Our advanced whois and rwhois query tool shows who owns the IP address showing up in your logs. Examine Internet Explorer caches (older versions only). Cache Forensics shows Internet Explorer history, cache and cookie information plus it shows Protected Storage information containing passwords and IE auto-complete data for the currently logged in user. Check for misconfigured SMTP servers. Email Address Validation and Open SMTP Relay Checking show configuration issues with SMTP servers. NetScanTools Pro is a great tool to help train people on the workings of various TCP/IP utilities. You can also use it to demonstrate security vulnerabilities and some of the common techniques used to map and access networks and machines. NetScanTools Pro is used in network security and reconnaissance or traceback training courses taught by Laura Chappell of the Protocol Analysis Institute. A "whitehat" toolkit used in "ethical hacking" training courses taught by SANS. "Installed" version for your desktop and laptop. The license allows for the software to be installed on two computers as long as you are the primary user of both. The software is delivered as a 'download'. "USB" fully portable version. We can pre-install NetScanTools Pro on a fast USB flash drive. You can use it on any Windows 10/8/7/2016/2012/2008 system that has a USB 3.0/2.0 port. If you prefer to use your own USB Flash Drive, we can supply a fileset and assistance in installing it. To use the USB version with Windows 10/8/7/2016/2012/2008 you must install WinPcap or Npcap (in WinPcap compatibility mode) on the host. The software is licensed to the USB flash drive and if you need to transfer it to a different drive you will need our assistance. Read more about the USB version and see pricing options. Videos of NetScanTools Pro Version 11 in action! Please review our videos on our site or on YouTube. Each tool description page has screenshots and videos. Requires Windows 10, 8.x, 7, Vista, 2012, 2008. NetScanTools Pro is a 32 bit program that runs on either 32 or 64 Windows operating systems. There is no OSx version. To use on OSx you will need to use Parallels or Fusion. Detailed Requirements. Section 508 VPAT. Voluntary Product Accessibility Template. NetScanTools Pro News and Revision History. Technical Details for each tool. End User License Agreement (EULA). Each license may be installed by a single user on a desktop and a laptop as long as the user is the primary user of both. Only one person may be registered to a single serial number. Installed version is licensed by user and his/her computer. You may install one license on one desktop and on one portable computer as long as you are the primary user of both computers. Installed version is sold as a download. Only one person may register a license (serial number). USB version is fully portable and is installed on a USB Flash Drive (not permanently installed on a computer), so it is licensed to the user and may not be copied to additional USB flash drives without our permission and assistance. It may be used on any number of computers, one at a time, and not simultaneously. This fully portable USB Flash Drive version does not require installation. Discounts we offer to educational, non-profit and government buyers. Installed version is $249 for a single license that you can install on a desktop and laptop. USB version is $299 for a license on a high speed USB 3.0 (works on USB 2.0 too) Flash Drive. Frequent releases (updates). Typically 4 to 6 releases per year -- an active maintenance plan (one year included with purchase) is required to get updates. A one year maintenance plan is included with a new license or upgrade. The free NetScanTools Pro demo is ready for you to try for 30 days! Download the NetScanTools Pro demo here.